San Salvador - A former mayor of El Salvador’s capital romped to victory in Sunday’s presidential election, winning more votes than his two closest rivals combined to end a quarter century of two-party dominance in the crime-plagued Central America nation. The Supreme Electoral Court declared Nayib Bukele the winner, saying he had nearly 54 percent of the votes, with nearly 90 percent of ballots counted. Carlos Callejas of the Nationalist Republican Alliance was far behind in second with less than 32 percent, while even farther back were former Foreign Minister Hugo Martinez of the Farabundo Marti National Liberation Front and a minor party candidate. 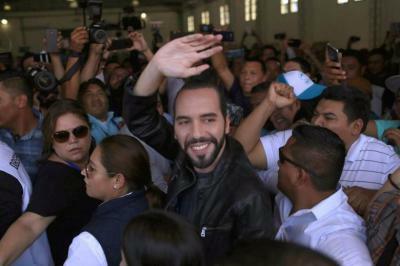 Bukele surpassed the 50 percent of the votes needed to avoid a March runoff, and he had already claimed victory before a jubilant crowd in the capital and invited supporters to celebrate in the streets. “We have full certainty that we have won the presidency, and we have won in the first round,” Bukele said. All four candidates promised to end corruption, stamp out gang violence and create more jobs, with crushing crime at the top of the agenda. Roughly 67,000 Salvadorans belong to gangs that terrorize their communities with extortion, murder and other forms of violence.